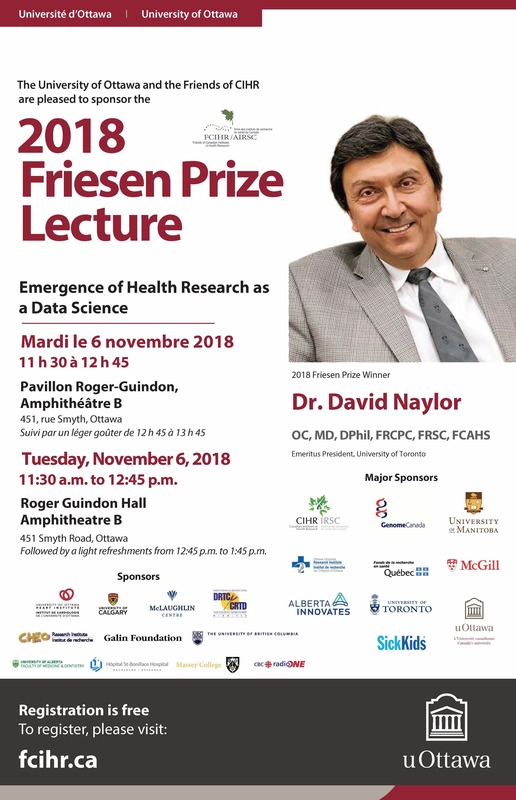 The University of Ottawa and the friends of CIHR are pleased to sponsor the 2018 Friesen Prize Lecture on Tuesday, November 6, 2018 at 11:30am in room RGN 2003. The Henry G. Friesen International Prize in Health Research was established in recognition of the distinguished leadership, vision and innovative contributions of Dr. Henry G. Friesen, a Canadian endocrinologist credited with redefining medical research in Canada. An annual fall lecture or series of lectures in a public forum features the current year’s laureate speaking on topics relating to the advancement of health research and its evolving contributions to society. This year’s event features the internationally acclaimed Dr. C. David Naylor, 2018 Friesen Prize winner and Emeritus President from the University of Toronto. Dr. Naylor will speak on the topic of Emergence of health research as a data science. This is a public forum lecture and requires registration. Please join us for the lecture, followed by the opportunity to meet our distinguished guest at the reception.